The world of project management knowledge sharing is changing. 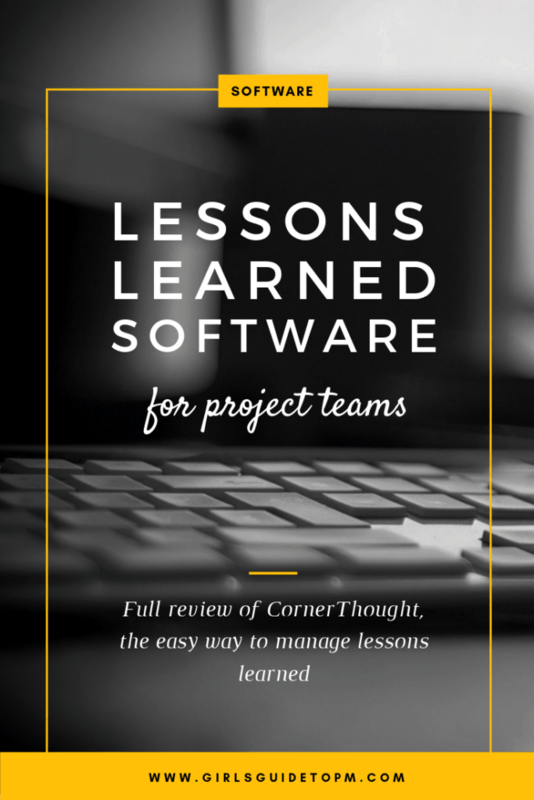 I’m delighted to be partnering with CornerThought lessons learned software for this article. It is hard to capture lessons learned in project management. It’s very easy to capture lessons learned. It’s very difficult to find helpful lessons that you can apply to your projects right now. The challenge is in the ‘learning’ part of lessons learned. Organisations don’t learn; they often don’t have the structure to do so. But what if there was a way of finding the right lessons at the right time? Instead of having to search back through lessons learned meeting minutes, a wiki or a database? As regular readers may know, I review a lot of project management software tools. Sometimes I reckon I’ve seen it all! But I hadn’t seen a tool like CornerThought before. I was invited to demo the tool, and it’s changed how I think about lessons learned databases. This is a win for algorithms! Let me explain what I mean. The CornerThought team has developed software that allows you to surface lessons learned throughout the project in a structured manner. When you log in, you see the most relevant lessons for where you are, and for your project. For example: you’re in an oil and gas project, execution phase. When you tell the tool that, it shows you the lessons from the execution phase for similar oil and gas projects. No searching, no guessing at what other teams might have tagged their lesson. It’s all structured and there for you. So let’s dive into my CornerThought review. The lesson learned software isn’t yet at a level where it can automatically work out exactly who is involved, the location and the rest of it. You do need to seed it with data before you start, and you do that through creating a project. And so on. This is all fully customisable so you can make the parameters whatever you want. Then you add project tasks. I thought this would be a huge overhead. Who wants to maintain a Gantt chart in your project management software and then another one in here? But actually it’s not that difficult. It’s really about the standard project management processes. Then add people to tasks: Fred does risk management, Marcela does scheduling. Beyond that, you don’t need any more detail. This is only to make sure that when Fred logs in he sees the risk management lessons first. Out of the box it comes with standard processes/tasks that look very similar to the PMBOK® Guide – Sixth Edition knowledge areas. You can import categories from other projects, so you only have to set this up once and then the bulk of it is already done for you. You can add lessons learned categories manually in CornerThought if you like, or import them. So you’ve got a lesson you want to record. What next? 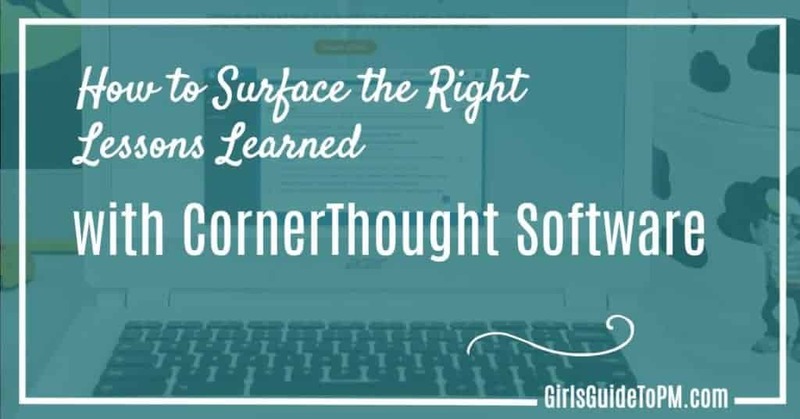 In CornerThought lessons learned software you can categorise a lesson as an issue (watch out for this next time) or a success (do this and get the same success next time). The actions you are taking to ensure this is either avoided or capitalised on for next time. You can add attachments for context. Importantly, you can’t see who added the lesson learned. This is deliberate and it’s designed to encourage more sharing. If a lesson is ridiculous or inappropriate, the project manager can delete it. Sometimes there are things you want to record but that you need to keep slightly under the radar. I’m thinking of relationships and organisational politics, in particular! CornerThought lets you choose who to share the lesson with. You have the option of people on the project team working on relevant tasks, the whole project team, or everyone. Often we want to take some action based on a lesson learned, perhaps tweaking a process to make sure the problem doesn’t happen again. You can track all relevant actions in the software. Add the action assign it to a team member and add a due date. You can add other meta data and categories too, if you want. Then, set up notifications to alert you to progress when people complete their actions. Documents can be added too, so if a policy is updated, for example, you can attach a copy. What’s even better is that you can link out to the document on SharePoint instead of having to upload it, so you make sure you are pointing to the most recent version. OK, so you’ve put your project and lessons learned in the software, but how do you get something back? You can create user alerts so that you get an in-app notification each time a new relevant lesson is added. But the main power is in the algorithm. 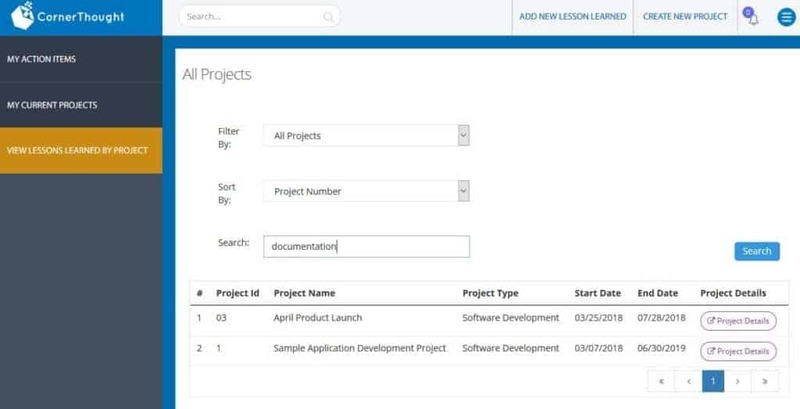 The lessons learned software looks for lessons that match the meta data for the project or task. It’s looking to check similarities with clients and locations, for example. Obviously the exact algorithm is secret, but it churns out a relevance score and shows you the most relevant lessons based on all the data it holds. There’s also the option to see ‘new’ lessons learned, which is a feed of things that have been recently added. And it’s a searchable software tool too, so you could browse around as well, with ranked search results showing you what’s most relevant to your current work. However, the power is in the fact you don’t have to do the traditional search. CornerThought will proactively give you what you need. You can set permissions based on role. 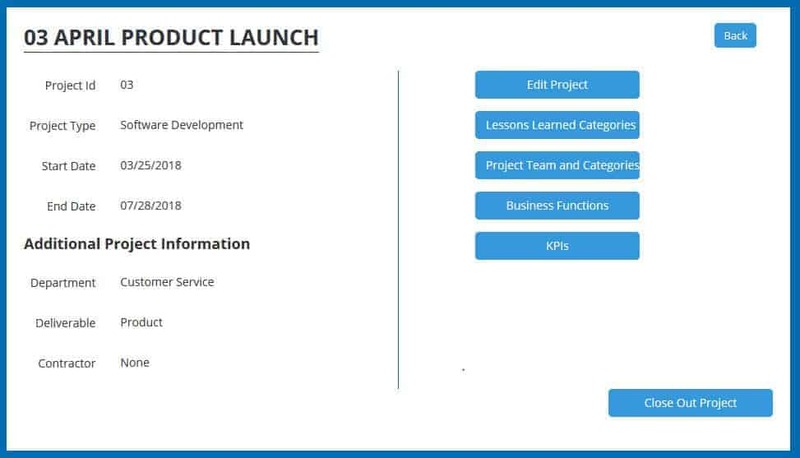 For example, if you have a project manager role, you can assign action items to team members. 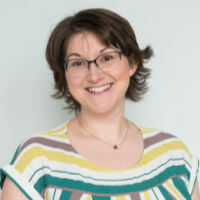 There are a number of out-of-the-box roles, from company administrator to a basic user who can add lessons learned for their project/task and only see things shared to them. 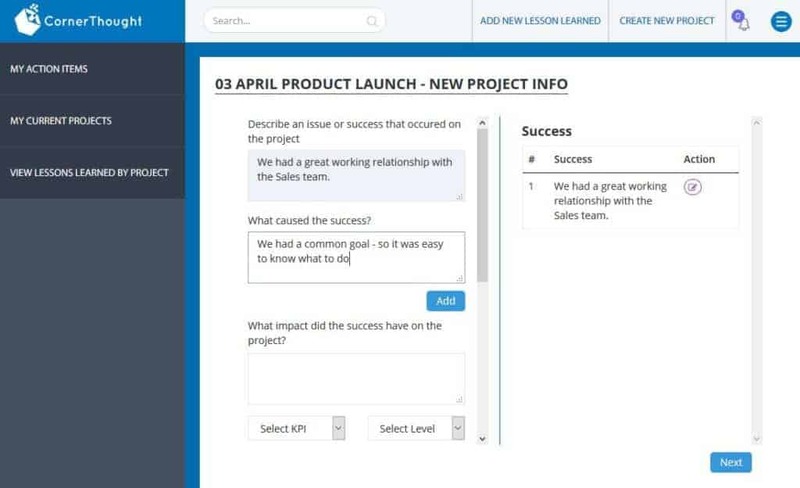 If a user adds a new lesson, the project manager will automatically be alerted by email. The biggest issue with lessons learned software is that databases aren’t intuitive. It takes ages to look through the archives to find something that might be useful. CornerThought removes that issue and makes it easy for you to find relevant information. It’s designed to be all about the user experience, surfacing lessons learned that are relevant to me and my project. In this review of CornerThought I’ve looked at the different features but I haven’t mentioned reports yet. You can create reports, although I’m not sure how much value they add beyond the database features and intelligent search that I’ve covered already. There isn’t yet a mobile app but the website is optimised for mobile so it doesn’t much matter. If you want to search the database from, say, a construction site, you could easily do that, and enter your own lessons from a ‘proper’ computer when you were back at base. However, lessons learned software is only as good at the data entered. It will take some time to populate the tool with lessons from a range of projects. I can see it working well in industries like oil and gas and construction, where projects have similarities in a way that tech projects often don’t. Overall, I was impressed with CornerThought. It takes lessons learned software to a whole new level, and I’d never seen anything like it. Why not try it for yourself? Click here to sign up for a demo and see it first-hand. I’d also like to mention to your readers that we will be offering a lifetime discount for signups before September 30, 2018! Check us out at http://www.cornerthoughtsoftware.com.